Since technology is foundational to every business, IT is positioned to drive real business transformation — but only when you invest in the one thread that connects it all together: people. Thousands of organizations rely on Oracle and SAP HANA databases for their business-critical, production workloads every day. These enterprise applications power their daily business operations, so having a successful backup solution is mandatory! IDC reports that enterprise databases, including in-memory and relational databases, continue to hold popularity both on premises and in clouds, thus reflecting the importance of being able to reliably back these up like other workloads. Many of these enterprise organizations also run Veeam to back up many of their solutions and have been asking for a way to integrate the backup, replication and restore features of Veeam Availability Suite, into a solution that works for these Oracle and SAP HANA applications as well. It just works… For Enterprise databases too! Veeam has a reputation of delivering simple, reliable solutions that work for any app, any data and any cloud and we are now extending this promise to supporting Enterprise Applications! Veeam is proud to announce that this integration with Veeam Backup & Replication is now a reality, enabling backups directly into Veeam repositories with Veeam Backup & Replication 9.5 Update 4 with Veeam Plug-in for Oracle and Veeam Plug-in for SAP HANA. This integration saves time and simplifies the overall management of backups for mission critical database solutions. Let’s dive into these benefits a bit further. Database Administrators (DBAs) have been leveraging the native backup solutions offered by Oracle Recovery Manager (RMAN) and SAP HANA (BACKINT) to protect and manage backups of their mission critical workloads. These organizations can now save time and improve operational efficiencies with the Veeam Plug-in for Oracle and Veeam Plug-in for SAP HANA, which allows them to simplify management of even more workloads within the Veeam portal for a holistic view of all backups. This saves time while keeping the DBAs in control. Veeam is excited to continue raising the bar on many more features for customers large and small. These enterprise application plug-ins provide considerable value to customers who may be looking to consolidate management of backups into one location, or to customers who have been hesitant to adopt Veeam due to lack of integration with enterprise backup tools. This enterprise application enhancement is just one of the exciting new features within Veeam Availability Suite 9.5 Update 4. Learn more about this and many other features in this update. The post Enterprise application integration for Oracle and SAP HANA appeared first on Veeam Software Official Blog. Veeam Instance Licensing changes everything, except price! People value flexibility. We demand it! Our lives are busy, and we strive to keep things simple no matter where we are. Whether it’s how we shop, how we consume information or how we interact with friends and family, we expect that experience to be the same whether we’re at home or on the go. That’s the same for organizations who are growing and stretching their business-critical workloads across multiple environments and into the cloud. They need flexibility! They need a consistently reliable experience that does not incur penalties and doesn’t increase costs. 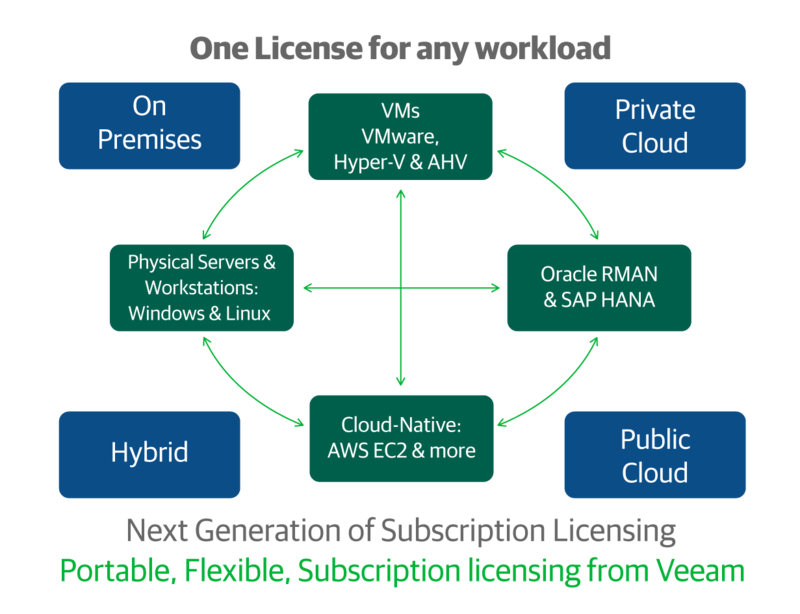 Veeam is stoked to introduce a new licensing solution that will provide a simple, flexible and cloud-ready licensing option that breaks down barriers for cloud adopters needing to back up and restore their valuable workloads. Veeam Instance Licensing (VIL) is the newest subscription licensing solution for Veeam products. VIL is portable and can be used to protect various workloads across multiple Veeam products and can be used on premises, in the public cloud and anywhere in between. Let’s first step back and discuss how this came about and why you should care. Veeam 2019 – Extending leadership in cloud data management! Organizations have various types of workloads ranging from virtual to physical, on-premises to cloud-native, and test/dev to production enterprise applications. Veeam has a portfolio of various products ready to support the total Availability of all these workloads, with backup and replication, monitoring, and much more. January 22nd marked a massive set of announcements from Veeam that extends our leadership in cloud data management. This announcement included Veeam Availability Suite 9.5 Update 4, Veeam Agents for Microsoft Windows and Linux v3, Veeam Availability for AWS and more. These releases were huge, adding many new cloud features furthering the capabilities that our customers demand. 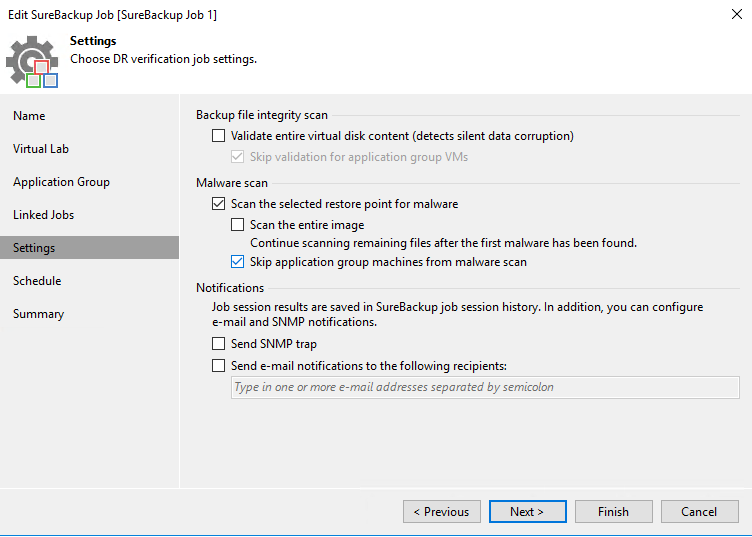 In fact, this was the biggest release in our history in terms of number of new features — check out the list for Veeam Backup & Replication 9.5 Update 4 alone here. Organizations are moving rapidly toward an increasingly diverse set of workloads ranging from virtual to physical, on-premises to cloud-native, and test/dev to production enterprise applications. This workload diversity is fueled the most by the accelerating trend toward hybrid and multi-cloud adoption. Customers are adopting clouds in various ways in order to gain greater flexibility, cost savings and advanced functionality. These diverse configurations are contributing to challenges to how customers manage their traditional and cloud-native environments, and this applies directly to licensing as users are now facing a myriad of different licensing requirements. Different licenses for different workloads and for different products made for a licensing nightmare. Some licenses could be used for some things, but not others. Other licenses couldn’t be repurposed. Veeam is responding to this concern proactively with a solution that addresses licensing complexities to make the move to multi-cloud environments simple with VIL. 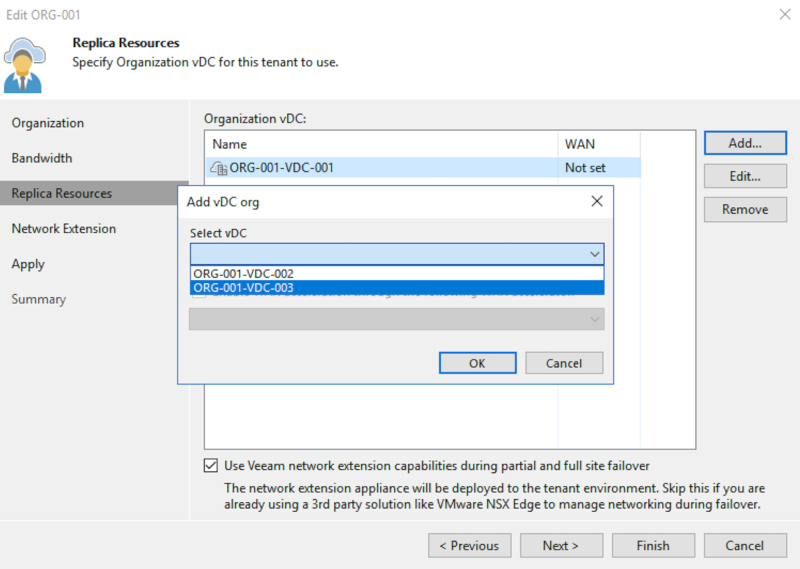 What is Veeam Instance Licensing? VIL is the next generation of subscription licensing at Veeam, replacing the existing subscription licensing for most products. It’s a solution that can be used across different workloads and different Veeam products. These licenses are sold in pools of licenses, in bundles of 10. Customers use these instances to license the workloads that they need. Need to protect 3 VMs, 2 agent servers, and 2 cloud native workloads on AWS? No sweat! One bundle of VIL licenses can do this for you regardless of what Veeam product you choose for protecting your workload. No need to purchase “product-specific” licensing any longer. You can probably already see how it solves some real challenges. For example, imagine you have a special VM that cannot be snapshot due to hypervisor limitation around its virtual hardware? No problem — you can just use Veeam Agent to protect this VM with agent-based backup, while processing the rest with host-based backups that Veeam Backup & Replication is so famous for — all from a single pool of licenses. But, the best part is the portability! You can move these licenses to the workloads that you need, when your needs change, wherever your workload resides. Today, your SQL Server may be running on physical — but in a few months, you may virtualize it on VMware. And perhaps in a few months, you have plans to move it to the public cloud? No problem — the Veeam license will follow, regardless of what Veeam product you decided to use for protecting your on-prem VMs, physical servers, workstations, cloud IaaS VMs or enterprise applications. No longer will you be locked into licensing that is product or workload-specific. Here at Veeam, we feel this portability is the right thing for the customer and we firmly believe this will make purchasing and managing licenses easier than ever. Fewer licensing headaches, greater flexibility, simplified ordering and management. That just makes sense! Ok, but what is an Instance? An Instance is our new unit of measurement for subscription licensing. Our most common use case is protecting a VM, and that will always utilize 1 Instance. In fact, most workloads require 1 Instance with our flagship Enterprise Plus edition, making everything super simple. Instead of metering licenses across various metrics such as per VM, per server, per workstation, per application, per user, per this and per that.. (Gosh, that’s exhausting!) we are standardizing on the license Instance as our unit of measure. Just like our products, Instance licensing will be offered by edition. While this adds some complexity, this is a necessary evil to accommodate our existing 320K+ customer base using different product editions. However, for new purchases, you will find that Enterprise Plus edition is the best choice, because it provides more platform capabilities at the same price. This is due to how Instance pricing is structured, with MSRP for all workloads (except VMs) staying the same regardless of the edition. It’s better to see something once than to hear about it a thousand times, right? Well, we have a nifty Instance configurator to help you figure out how many Instances you need. Check it out or contact your sales associate or your partner for assistance. The. Price. Is. Not. Changing! There must be some hitch here, right? Nope. The subscription pricing is not changing for any of our products. It costs the same to protect each particular workload as before — when we first introduced subscription licensing. However, please remember that the Instances are sold by edition, and while lower editions may have increased “weightings” for certain workloads, this does not result in 2-3x the cost. Let’s take the Veeam Agent for Microsoft Windows server for example. No matter what edition you purchase, the cost to protect an Agent server is still $150 USD MSRP no matter what edition you choose. A Veeam Agent for Linux workstation is $50 MSRP regardless of edition. Same goes for Nutanix VMs which is $150 USD. Three standard Instances will protect one server and one Enterprise Plus Instance will protect one Server. The weighting per edition is different, but the price stays the same. If you need various workload types to be centrally managed, we just require that you keep the edition the same across the single license file. Veeam Instance Licensing is available for several products and workloads, check out the list here. Is your product or workload not on this list, such as the case for Veeam Availability Orchestrator or Veeam Backup for Microsoft Office 365? No sweat — keep licensing those the way they are today. Subscription Licenses will no longer be sold “by product,” because they can be used for ANY product, but rather in a pool of Instances in minimum bundles of 10. Customers can now, for the first time, have both Perpetual and Instance Subscription licensing in the same centrally managed environment. This was a huge request before — and we made it happen! Just keep the edition consistent and you’re all set. Perpetual licensing IS NOT going away! Continue using Perpetual, per socket, licensing for your VMs on premises. BONUS: We’re even going to give you up to 6 instances to kick the tires of Agents, Availability for AWS and more with no strings attached! Legacy subscription licenses will be converted to Instances and upon installing Update 4, these customers will be asked to update their license file and will have a 90-day grace period to do this. Those of you who have both perpetual and agent licenses, this applies to you too, but you’ll also need to merge your licenses into the single file. After upgrading to Update 4, you will have 90 days to get your legacy agent license replaced with an Instance license — and until you do, you can use unlimited agents. So, don’t worry if you run into any license management issues — our licensing support department is here to help. Veeam continues to raise the bar and do what is right for our customers. Licensing is becoming more portable for the masses and no longer a barrier for multi-cloud users. Learn more about VIL on our Instance licensing page and check out our Instance license configurator. 2019 is off to a great start and we are so excited about what lies ahead. Veeam Availability Suite 9.5 Update 4 and its complementary products are cloud-ready and so is our licensing solution. Let us help you achieve your goals in 2019! The post Veeam Instance Licensing changes everything, except price! appeared first on Veeam Software Official Blog. Ever wonder just how much information is publicly available about you? Ever wonder how cyber criminals harvest information and customize attacks for their victims. The technique is called Open Source Intelligence (OSINT) and it is far simpler and more powerful than you think. It’s safe to argue that, to date, the May 2018 implementation of the General Data Protection Regulation (GDPR) in the European Union, as well as the two-year ramp-up period that lead to the activation date, has elevated the status and industry press coverage of compliance-related issues more than any other data protection and compliance standard set by governing bodies. The truth is, today, the stakes are high for organizations that continue to struggle with the proper management of sensitive, personal data or regularly failed audits, and IT professionals know this. In fact, in a recent study, Veeam customers were asked which corporate governance regulations have had the greatest impact on their data protection strategy and even though the new standard had been active for less than half a year, 28% answered “GDPR”, which was enough to make it second on a long list of regulation standards, some of which have been in effect for two decades (source: ESG Data Protection Landscape Survey). So why is there so much concern? Because no business can afford a data breach and the subsequent debilitating press coverage, or customer alienation and fines that accompany such a negative event. According to a 2018 study, the average total cost of a data breach is $3.86 million, which for those of you who are curious, breaks down to $148 lost or stolen per record! And probably most concerning, for those respondents who had been through a data breach, they said they’re not completely convinced they can prevent a future data breach event from occurring. Almost 28% of this group indicated a recurring material breach was likely to happen over the next two years (source: 2018 Cost of a Data Breach Study). The good news is, for Veeam customers who are losing sleep at night over compliance or other use cases, the latest release of Veeam Availability Suite includes Veeam DataLabs Staged Restore, which is a new and powerful feature designed to help manage compliance and ensure that sensitive data is removed from backups before the data has a chance to make it back to a live environment. Veeam DataLabs Staged Restore can also be used for other helpful use cases outside of compliance, including masking data for DevOps. 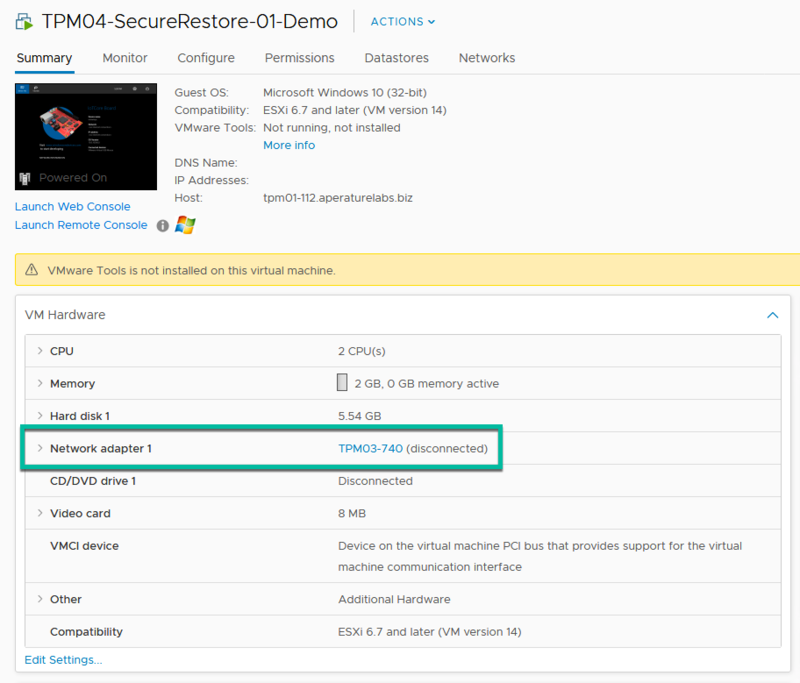 As I have already mentioned, the primary purpose of Veeam DataLabs Staged Restore is to enable a process to be injected into the recovery process of your virtual machines (VMs) that can help you easily and confidently manage compliance-related issues, such as those related to GDPR. The most typical use case is ensuring compliance after a failure scenario when recovering a machine back into production where data potentially needs to be removed or masked. The ability to inject a script into the recovery process allows for the restore point to be modified before landing into the environment. In this scenario, a use case may be a DevOps environment where a business would like to leverage the latest version of data in their own segregated environment for versioning. But, from an operations point of view, the data may contain personal identifiable information (protected by compliance standards) that must be masked before landing in the new environment. 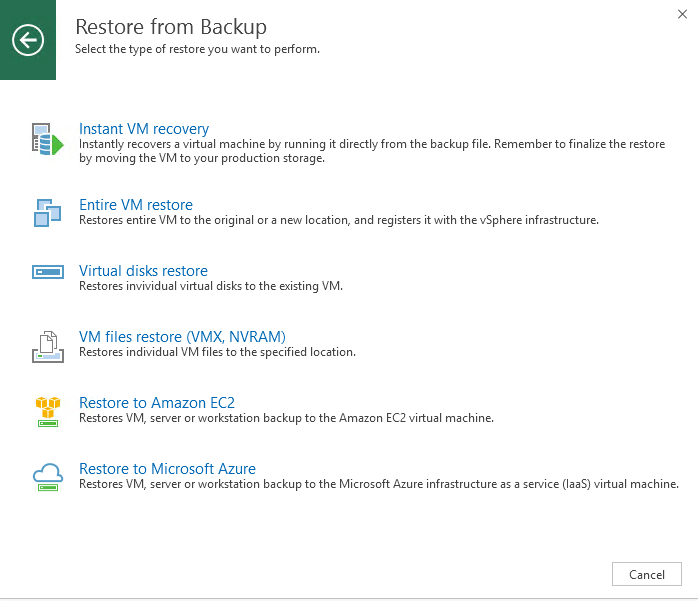 Veeam DataLabs Staged Restore is one of the latest additions you will see as a selection option when the entire VM recovery wizard is started. If needed, this also gives us the option to inject an additional script into the VM we are recovering. The wizard shown below has several options. Virtual lab – The virtual lab is an isolated virtual environment that is fully fenced off from the production environment. The network configuration of the virtual lab mirrors the network configuration of the production environment. Application group (optional) – An application group consists of any VMs that the machine you are recovering may need to have to authenticate and function. It’s a group of dependants to the proposed machine for recovery. 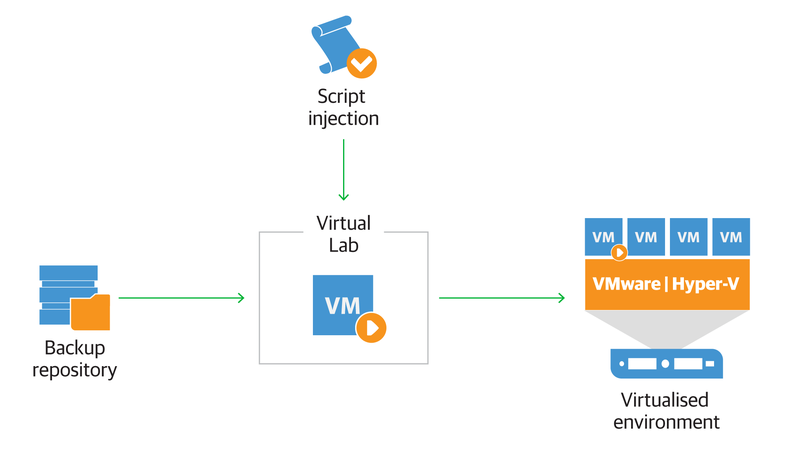 Script – It’s required that the script remains located on the Veeam Backup & Replication server as this is the route taken for the injection into the virtual lab. Credentials – For the script to be injected into the VM and to be executed, the required credentials should have the ability to authenticate and run the script. Advanced – This allows for different options to take place. The first option is memory. 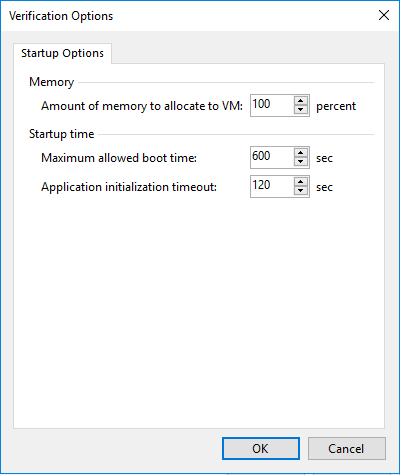 As part of the recovery process, if you would like to increase or decrease the memory percentage assigned to the VM, then you can manage that here. You can also define boot and application time. This will depend on the services and resources available on the VM, but those that can be adjusted accordingly as well. Once the wizard is completed, the recovery process will begin with the virtual lab appliance powering on within the environment, along with the presentation of the backup folder from the backup repository to your virtual environment. This uses a patented technology called vPower NFS. vPower NFS is used to present the backup file into your virtual environment as a datastore. This allows for a very fast way to get a machine up and running in the environment. However, the performance depends on the performance of the backup disk being used. So, the next step in the process is to power on that VM from the new datastore into our virtual lab environment. This environment is safely isolated away from production, however the VM has not had its IP address changed and will still have this when it boots. The IP is masqueraded through the virtual lab appliance so you can gain access through the Veeam Backup & Replication server. Now that we have our recovered VM that’s running in an isolated environment, the next step is to inject the script that we defined in the wizard. This entire process is automated, so there is no need for intervention. It is likely that by adding the script, the data will be modified in some form. 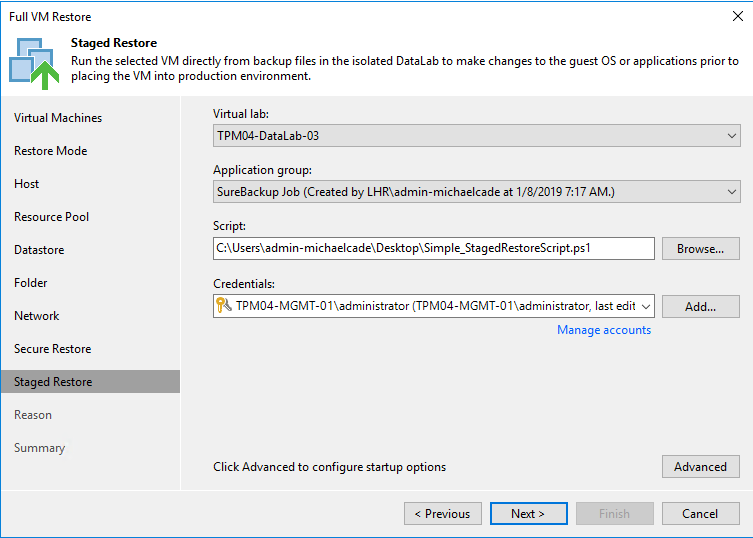 All of these changes will be captured inside a production datastore that was defined during the restore wizard phase and not in the backup file, as we want to keep the backup file as a functional restore point. Finally, when the script has finished successfully, the process will continue the recovery steps. To do this we use a Veeam technology called quick migration. Veeam Quick Migration enables the ability to migrate the VM between datastores. 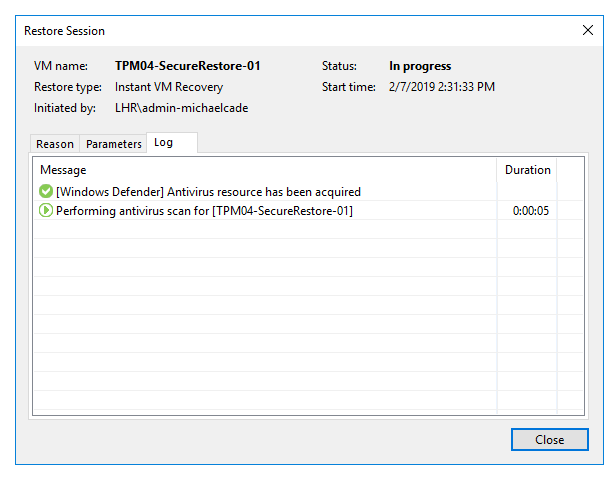 When the process is complete you will have your recovered VM within the environment, including the injected process. We hope this feature will help you be more reactive and efficient in staying compliant to a multitude of situations and requirements. Give Staged Restore a whirl and let us know your experiences in the comments! 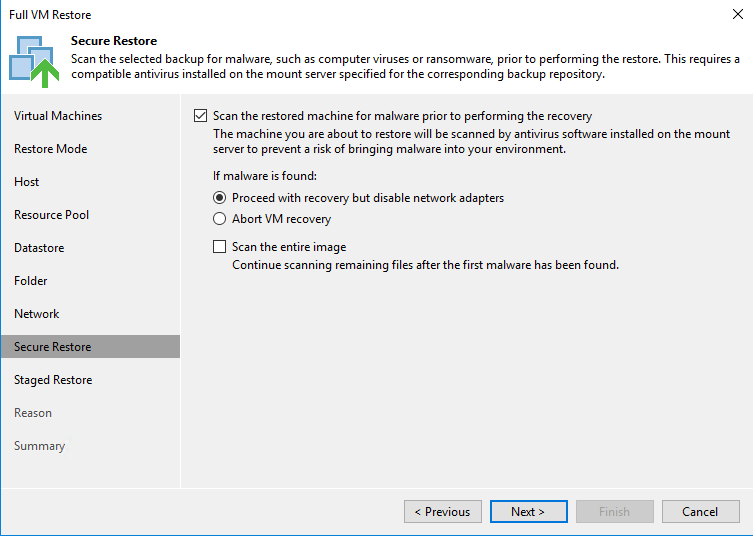 The post Compliant data recovery with Veeam DataLabs Staged Restore appeared first on Veeam Software Official Blog.